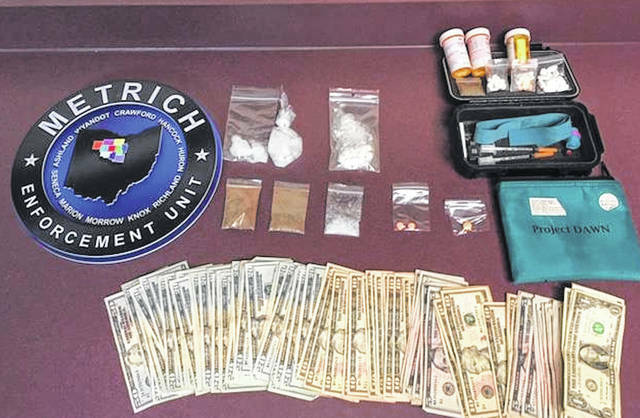 A search warrant in Chesterville produced approximately 39.5 grams of suspected meth and approximately 15.5 grams of suspected heroin, along with cash. Four people were arrested. MOUNT GILEAD — The Morrow County Sheriff’s Office, with the assistance of the Knox County Sheriff’s Office, the Mount Vernon Police Department, Ohio BCI&I and the Metrich Drug Task Force served a search warrant on Squires Street in Chesterville on Monday. Arrested at the scene were Ashley Simms, Melissa McGuirk, Joshua Disbennett and Brian Hamilton. All had outstanding warrants for their arrests. A search of the residence produced approximately 39.5 grams of suspected meth and approximately 15.5 grams of suspected heroin. Also located inside the residence was suspected prescription medication and approximately $1,456 in cash. The Morrow County Sheriff’s Office would like to thank the Knox County Sheriff’s Office and the Mt. Vernon Police Department for the use of their SRT Team, Morrow County Sheriff John L. Hinton said.